Yes, pic is upside down….that was intentional…thanks. The pic is of me doing calf stretches (imagine yourself in a sort of downward dog position with one leg straight and one leg bent) after my p90x plyometrics workout yesterday. 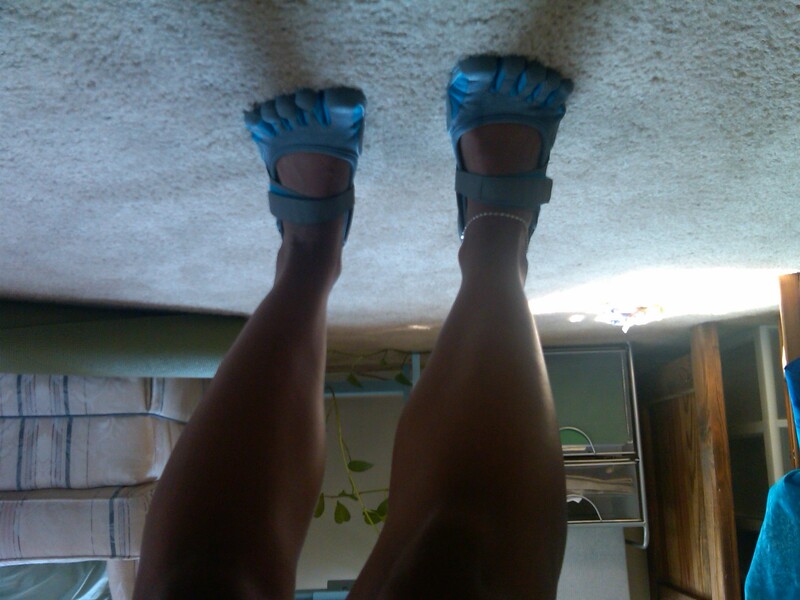 I actually used the toe shoes on Tuesday which worked out really well for weight training. But I really wanted to see how they would work during a cardio session. I’m not even going to bullsh!t you, the toe shoes feel funky on your feet at first. Not funky in a bad way, but just different. If you’ve ever had a pedicure, it is almost like having the toe separator between your toes, but not quite that drastic; its just an odd feeling I guess and I was definitely distracted during the first 10 minutes of working out. But that quickly passed….and I absolutely love them! They’re so incredibly light and they almost make you feel free; like you’re not boxed in….like this is how we’re supposed to workout…like you’re 7 years old and running around buck-wild outside on grass…you get the idea yet? With all the jumping I was doing, I was worried that my landings would have been really hard, but you instinctively land on the balls of your feet which softens the landing which is how we should land. I’m seriously in love with the shoes. Right now, I have the Sprint but when I get out of the unemployment line, I can totally see myself getting an inside-only pair like the Performa Jane. I know they look weird (eh hem, Amanda and Soca Silky) but give them a chance. Birthday Shoes is also a great site for all things toe shoes. Nice! Definitely psyched you like them. I want a pair too! Have you been outside and ran with them yet? Nope, I have’t run outside yet….soon come! cool breakdown on the shoes.. always wondered about those. how much do those run for generally? Thanks! They’re between $80-$150, roughly.